The award-winning Cineo MaverickTM mid-power softlight is now available in a color-tunable version: the Cineo MavX. It provides all of the color rendering and output benefits of Remote Phosphor, while offering the ability to dynamically color tune from 2700K to 6500K. MavX includes several updated features designed to make it the perfect lighting tool for small studio and portable applications. Compact, exceptionally durable and powerful, MavX delivers a volume of light equal to a traditional 1K soft source with no color shift or icker at any output level. 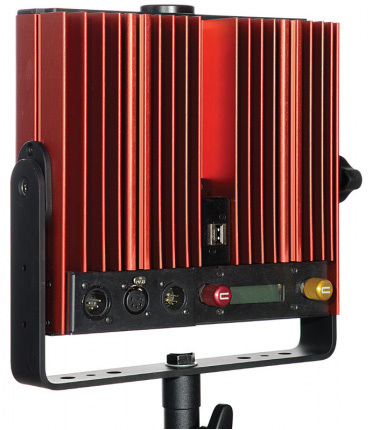 Like all other Cineo Lighting fixtures, MavX uses passive thermal management for completely silent operation. MavX supports Cineo’s Photo-Accurate Dimming, which matches the dimming curve to camera stops. Local control is simple and intuitive, complimented by both wired and wireless DMX control built-in. For studio applications, MavX delivers up to 8,000 lumens from a lightweight, compact package: perfect for lighting broad areas where grid height is challenging. A wide range of accessories includes barn doors, louvers and softboxes for accurate lighting control. MavX is also ideal as a portable, battery-powered soft source. Cineo’s patented SmartPowerTM technology provides consistent light output during battery operation regardless of the charge state of the battery. It also protects to your battery eet by providing adjustment to the fixture’s current draw to match the output capability of your batteries. Extremely accurate color rendering is achieved with Cineo-developed LED phosphor formulations, color- tunable from 2,700K to 6500K, with accurate presets at 3200K, 4300K and 5600K. 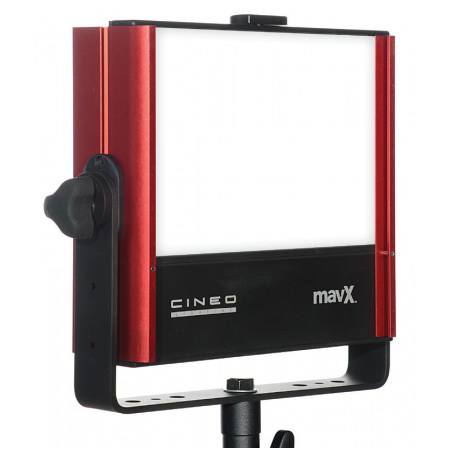 The Cineo MavX is the smart soft lighting choice designed to t nearly every installation or production budget. CCT Foot-candles @ 10ft. Lux @ 3m.